Where’s Walton? – Where's Walton? 1) The travel blogs where I tell you all my favourite places to visit – these are my easy go-to links where when you ask me ‘what do I do in Iceland‘ (for example) I can just ping you the link and job done. 2) What I’m really up to and my mental state at that time whilst travelling – the ones I write for myself or my best friends (like this one) where I give an honest picture of myself, where I am and what’s been going on – often over the top and slightly cringe but give a more honest written time capsule of what travelling is like for me. An example of this is my time in Kyoto, Japan. I’m not a good writer, at all. I just like to write because a pretty picture on social media just isn’t enough to share sometimes and it doesn’t fill me with the same joy that this blog does. Planning and budgeting a trip takes a while to piece together; it takes a lot of spreadsheets, reading of blogs, price comparison websites and reading reviews before I actually book something. But then once that trip has happened, I’m on to the next adventure and I forget to document what I did and how I did it – I simply just post a few pictures on Instagram and move on. But I always feel like not documenting a trip on WheresWalton.co.uk is almost like that trip is unfinished (potentially the Project Manager in me talking). It’s nice to document what happened, what didn’t happen, what I saw and what the place was like to remember the trip. I’m 30 years old now, I’ve been to over 40 countries (30 of them in the last 4 years) and as I’ve gotten older I’m starting to recall less and less of the little details; I’ve started to forget people I’ve met along the way, names of places and the food I tried. It’s a shame because I used to be able to remember everything but these days I don’t so it’s nice to have something written down to look back on and feel proud of. When I read back past blogs, the ones that I love the most are the ones where I’ve commented on what I was going through at the time and that’s what sparks a memory or an emotion. So I write. Sometimes I ‘publish’ and sometimes I click ‘save’. But I’m going to try to share more, even if it is a big cringe at times. For those who don’t know, in September 2017 I quit my London job in Digital Marketing (for the 2nd time) to travel with my boyfriend, Stu. It’s been an incredible so far. 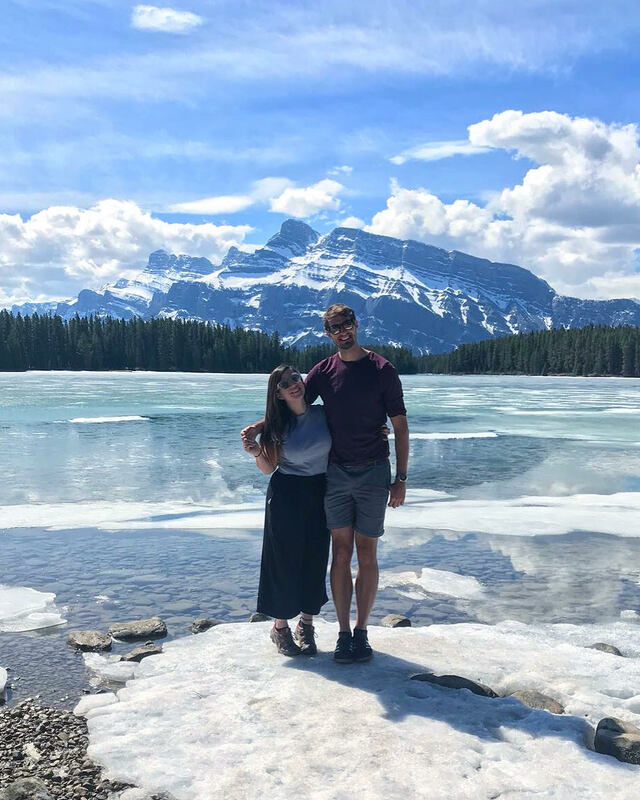 I have lived in Australia for 5 months in 3 different homes, spent my 30th birthday island hopping in Fiji, spent 36 hours in Hawaii and I’ve just spent 11 weeks travelling West Canada. Life is good, we really are ‘living the dream’ and I’m not taking one moment for granted, because let’s face it – I’m not getting any younger. It’s the 8th May 2018, I’m currently sitting in a cafe in Canmore, Alberta, Canada. I am looking down at a cup of, now cold, flat-white coffee. This coffee has been sat in front of me for two hours because on my unemployed travel budget I’m too cheap to buy a second cup of coffee but also don’t want to leave. Outside of the cafe window I can see snowy topped mountains in the distance and blue skies and I’m wondering how Stu and Andy (one of the travel buddies we adopted in Canada) are getting on with their midday mountain hike. For me, it’s a good day because it’s my “day off” whilst travelling where I try to plan as little as possible and usually catch up on admin. For me, this means either doing laundry or going to the most highly rated cafe in town for coffee where I buy a flat white coffee (always) and then I can plan my next trip, catch up with friends back home or I can write something and acknowledge where I am and how far we’ve come. Was a career break the right decision? When we left the UK last year we didn’t exactly have a plan. We just had time, some money saved and two working visas which gave us options and the freedom to be a little spontaneous. We had a surprisingly mixed reaction from people about our trip. The majority was positive and it was really encouraging to get so much overwhelming support from co-workers, family and friends about what we were doing. So many people told me they either wish they had done it, regretted not doing it or we’re hoping to do it one day. Even people we’ve met along the way have applauded us on what we’re doing and it really means so much to get this kind of support, because it honestly isn’t easy, it is really daunting at times and it wasn’t something anyone in my social circle was actually doing when I made this decision. However, on the other hand, we have had some negativity about how leaving a long term job / career is potentially a mistake, that perhaps it’s better to continue working and instead take short trips here and there until we retire. At the end of the day though, there really wasn’t any real reason to stay other than for a job. Nine months later, looking back I honestly do still think we made the best choice. We have enough work experience to not struggle finding a job again AND we both agree we wouldn’t want to work for a place that didn’t see what we were doing as a positive life move. I just honestly do feel we’re ‘living the dream’ because as much as we needed a job to save to do all the things we’re doing now, it’s still just a job and doesn’t fulfil or define us. When I arrived in Sydney in September 2017 it was the start of summer and within a week or so I honestly didn’t want to leave. The lifestyle in Sydney was something I’d always craved in the UK. I loved the weather, the coffee culture, I loved the sheer amount of independent businesses like restaurants, cafe’s, bars, I loved being able to be outside more and I loved the coastline and long list of ways I could evenings and weekends. When it’s sunny as often as it was in Sydney, you don’t want to waste any time. It really did feel like a home away from home, but just without my friends and family. One memory I’ll never forget is one evening walking along Coogee Beach, I had just treated myself to a sushi train dinner (alone) and whilst I was walking home the sun was setting, I just sat on the sand watching the tide come in and out. It occurred to me that I live here. I lived in Sydney, and I lived by and with a view of the ocean. It was the first time I truely felt like I was #LivingMyBestLife – the hashtag I often cringe at the sight of on social media, but I felt like I was the epitome of. I actually felt proud of myself for the first time in years, like I was doing something right and for the first time in my whole life I felt like I had the perfect work / life balance. At that time I was living just a 3 minute uphill from Coogee beach – we had an outdoor pool and a balcony with a view of the ocean. Taking this all in and looking around at where I was, I honestly felt sick at the thought of leaving. I went home that evening and told Stu he was “breaking my heart for making me leave”, which was over-dramatic but 100% how I felt at the time. I actually did think about not going to Canada and instead accepting a sponsorship to stay in Australia longer. I think that if I was in my early 20’s I would have stayed for a few years, but I’m not, and if I want to start a family one day (which I do) I would like to do all the things I can only do with the freedom I have now… Which is why I’m travelling again now and planning to travel again for another year of living out of a suitcase and sleeping in hostels. So, get to the point, what’s the plan then? The plan (at the moment, it changes regularly) is to continue to travel and work abroad for the next year or so. We’re going to go back to Sydney to work (because the wages are higher) and save up as much money as we can to travel for the next 6 months. We are going to travel New Zealand (2nd time for me) but this time by car, then we’re going to backpack from Mexico to Belize, Guatamala, El Salvador and Hondaras (sadly we can’t go further at this time due to the unrest in Nicaragua). Then we’re spending Christmas in our home town back in England followed by India, Nepal and Sri Lanka. Then the plan is to spend a couple months back at home again for a few weddings then work in Canada for the summer.